Franklin Delano Roosevelt Memorial is located in Washington, DC. President Franklin Roosevelt will always remain associated with the National Park Service. During a speech in 1936, he appreciated the national parks, arguing that there is nothing more American than them. According to his opinion, the fundamental idea is that the country actually belongs to the people. 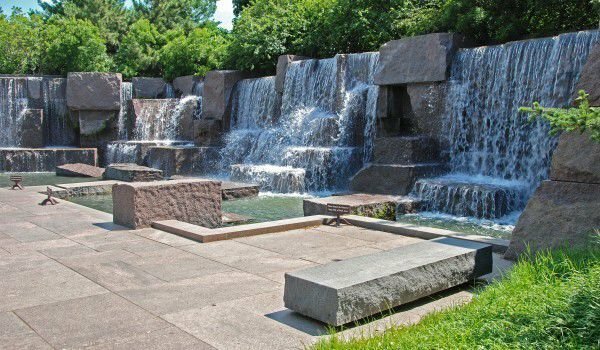 Franklin Delano Roosevelt Memorial covers an area of seven and a half acres. On the territory of the memorial is a lot of water. Water was a very important part of the life of President Franklin Roosevelt. When he was young, he lived near the Hudson River, where he loved to swim and sail. During the First World War, Franklin Roosevelt served as Assistant Secretary of the U.S. fleet. He was paralyzed after being sick with polio, at thirty-nine years old. To support other people with this disease, Roosevelt founded the Georgia Warm Springs Institute, whose purpose is to help people with this problem. Much water, especially waterfalls reduce noise from airplanes taking off and landing at the airport, which is located near the Potomac River. Although he was paralyzed from the waist down and spent more time in his life in a wheelchair, President Roosevelt was an outstanding leader of the nation. For proof of his indomitable spirit, serve his famous words: "The only thing we have to fear is fear itself". Franklin Roosevelt led the nation during the Great Depression and World War II. The Memorial is homage by Americans to this major historical figure, who played an important role in the history of the country. Various statements of President Roosevelt are carved on stones, which are located on the territory of his memorial. On the territory of the memorial are statues that can be touched by visitors. What is prohibited is climbing on the statues, and sitting on them. Sculptures within the Franklin Delano Roosevelt Memorial depict the president as well as the men and women he led through one of the most difficult period of American history. The statue of President Roosevelt, sitting in his wheelchair, was not part of the original design of the memorial. It is located at the entrance of the memorial. This statue was not presented during the opening of the memorial in 1997 and was added in 2001. Different parties and organizations, including the National Organization for the disabled believed that it is appropriate for President Roosevelt to be presented at the entrance of his memorial, sitting in a wheelchair. The sculptures are inspired by photographs. One of them is Franklin Roosevelt with his favorite dog Fala - a Scottish Terrier, who proudly wore a collar engraved with his name and the words "White House". Other sculptures represent scenes from the Great Depression, like a queue for bread. There is also a bronze statue of his First Lady - Eleanor Roosevelt. The territory of the memorial is a place where there are reliefs and inscriptions of Braille, specially designed for blind visitors. Unfortunately some of these signs are located so that they can not be attained even by very tall people, which makes absolutely no sense putting them there, because no blind person can read them. This has caused serious criticism from people who are visually impaired.